As reviewed in the Daily Mail: 'In this updated edition of her short and tender account of the GPC, Emily Mayhew reminds us that World War II changed Britain's view of heroism.' Read the full review here. You'll be £17.99 closer to your next £10.00 credit when you purchase The Guinea Pig Club. What's this? The history of the Guinea Pig Club, the band of airmen who were seriously burned in aeroplane fires, is a truly inspiring, spine-tingling tale. Plastic surgery was in its infancy before the Second World War. The most rudimentary techniques were only known to a few surgeons worldwide. The Allies were tremendously fortunate in having the maverick surgeon Archibald McIndoe nicknamed the Boss or the Maestro operating at a small hospital in East Grinstead in the south of England. McIndoe constructed a medical infrastructure from scratch. After arguing with his superiors, he set up a revolutionary new treatment regime. Uniquely concerned with the social environment, or holistic care, McIndoe also enlisted the help of the local civilian population. He rightly secured his group of patients dubbed the Guinea Pig Club an honoured place in society as heroes of Britain's war. For the first time official records have been used to explain fully how and why this remarkable relationship developed between the Guinea Pig Club, the RAF and the Home Front. First-person recollections bring to life the heroism of the airmen with incredible clarity. This is a revised and expanded edition with new material, including a foreword by HRH Prince Harry, published to tie in with a major new film expected to be released in late 2018. All I can say about this book in conclusion is that it is one that everyone should read, whatever your views on war, military and social history. That there are two forewords, one from Prince Harry and the other by the Duke of Edinburgh should tell you everything you need to know about its contents. There are several photographs that tell their own story. Let me be honest, few books bring my emotions to the surface. This one did. I cried: as much for the uplifting narrative as the real horror of war. Brilliant, absolutely brilliant. 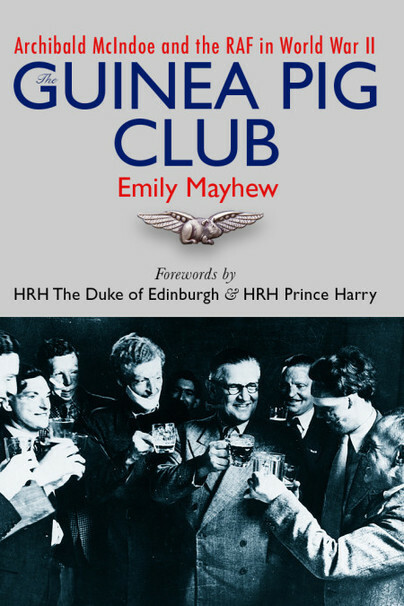 Based on extensive research and moving first person recollections, this absorbing book reveals the heroism and triumphs of the courageous Guinea Pig Club members. In this updated edition of her short and tender account of the GPC, Emily Mayhew reminds us that World War II changed Britain’s view of heroism.